We finished with a discussion about our next in-person update, and apparently there isn't a single date between now and July where the board is free. I'm guilty of not being free six weekends: running the MDTTC Open on Apr. 14-15; coaching at and running the tournament at the Hopes Camp and Tournament in Maryland Apr. 27-29; a panelist at the Balticon Science Fiction Convention May 25-27 (my other "life"); running the Maryland State Championships June 2-3 and my annual science fiction writing workshop vacation in Manchester, NH, July 20-28 (covers two weekends). We will likely try to have the board meeting either just after the World Veterans Championships (June 18-24) or just before the U.S. Nationals a week later (July 1-7). I plan on staying the entire three weeks, taking a one-week reading/writing vacation in between. Here's the video (3:01) from the BBC. "This is the story of North and South Korea's ping pong stars, who joined forces and became firm friends - but it didn't last." Here's the video (3:05). I think he's using medium long pips. Watch it once to see how this kid plays. Watch it a second time to see the expressions on his poor opponent, who probably has never faced anything like this! Here's the video (3:05). This style used to be common, now it's almost extinct. It'd be great to get more diversity like this back into our sport. Here's the video (59 sec) as they play with three tables, placed end to end. I can't wait for them to go for that short ball! This Is the Coolest Ping-Pong Table! Here's the video (49 sec). Here's the video (28 sec). Why not try this out at your club? Alex was also over 2700 for a number of months the last three years, with a high of 2722 before dropping to a likely temporary 2615. The lefty Alex may have the best pure serve and forehand rip game in North America, and you could see much of the match came down to Wu trying to stop that, and when Wu serves, trying to stop Alex from counter-ripping winners. 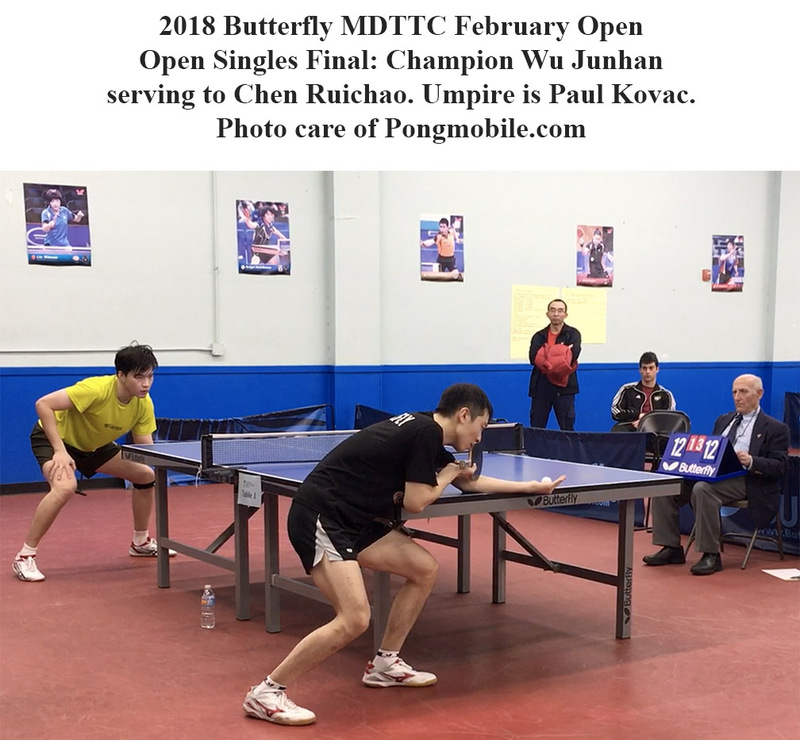 It wasn't easy - here's video of the shot of the Tournament (46 sec, video by Mossa Barandao of PongMobile) - Chen Ruichao's lunging, down-the-line counter-smash in the Open Final against Wu - at 12-all! But I noticed something about Wu - he is incredibly quick at reading service depth. When Alex served short, Wu would almost always receive backhand, even if the serve was short to the forehand, using a topspinny backhand banana flip. If the serve was the least bit long, he'd forehand loop it. The result was Alex was perpetually trying to counter-attack against these topspin attacks, which put great pressure on his third-ball attack. Early on Wu dominated with these tactics, but gradually Alex got used to them, and his attacks began to hit more and more - but Wu's attack almost never missed. After winning the first two easily, Wu had a battle on his hands for three games - with Alex winning a pair of 14-12 wars, and leading 9-8 in the game he lost at 9 - before Wu pulled away in the sixth to win, 3,6,-12,9,-12,6. Congrats to Champions Wu Junhan, Khaleel Asgarali, Vikash Sahu, Stephen Emmons, Stephanie Zhang, Wang Zhantong, Sameer Wadkar, Danny Wan, Eugene Cristoaica, Jackson Beaver, and Mu Du! The closest battles? 12-year-old Danny Wan "eighting" things up in the Under 1300 final, where he was up 5-0 and 10-8 match point in the fifth against Sameer Wadkar, but lost four in a row to lose at 8,-8,-8,8,10. He took it pretty hard, but went back out and won Under 1000, and celebrated equally hard with his two trophies. 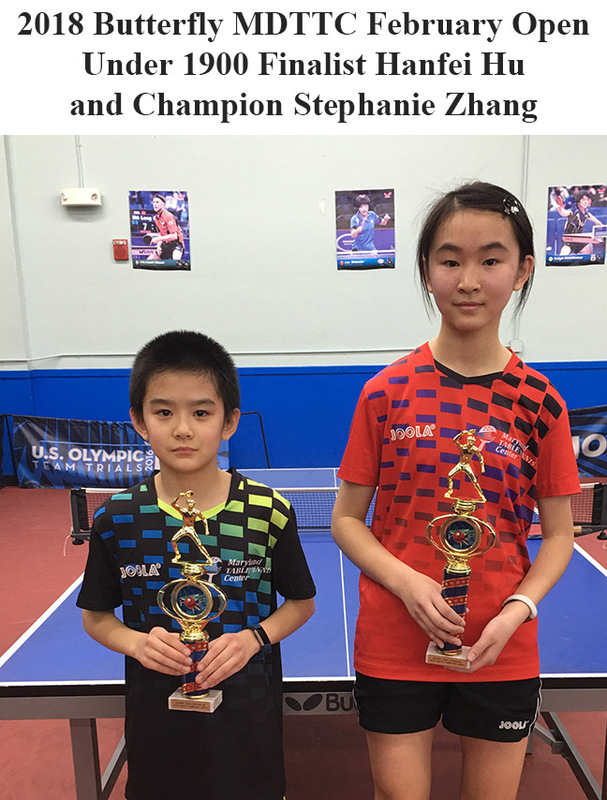 In Under 1900, 14-year-old chopper Stephanie Zhang had a pair of 11-7 in the fifth wins in the semifinals and final. In the Over 50 final, top-seeded Michael Huang was up 2-0 on Eugene Cristoaica, but Eugene came back to win, -6,-8,10,7,8. The biggest romps were Vikash Sahu's 18-0 game record in winning Under 2200, and Mu Du's 12-0 record in winning Under 12. (Both were top seeded.) Khaleel Asgarali sort of romped in Under 2400, where he was also top seeded at 2397, going 9-0 in the quarters, semis, and final - but in the preliminaries he had to battle with Aldin Soneja (2025) and Costel Constantin (1948), at 8,-8,7,7 and -11,7,8,9 respectively. 11-year-old Jackson Beaver also sort of romped in the Under 15 event, losing only one game in four matches - partly because he went 5-0 in games that were 11-9 or deuce. 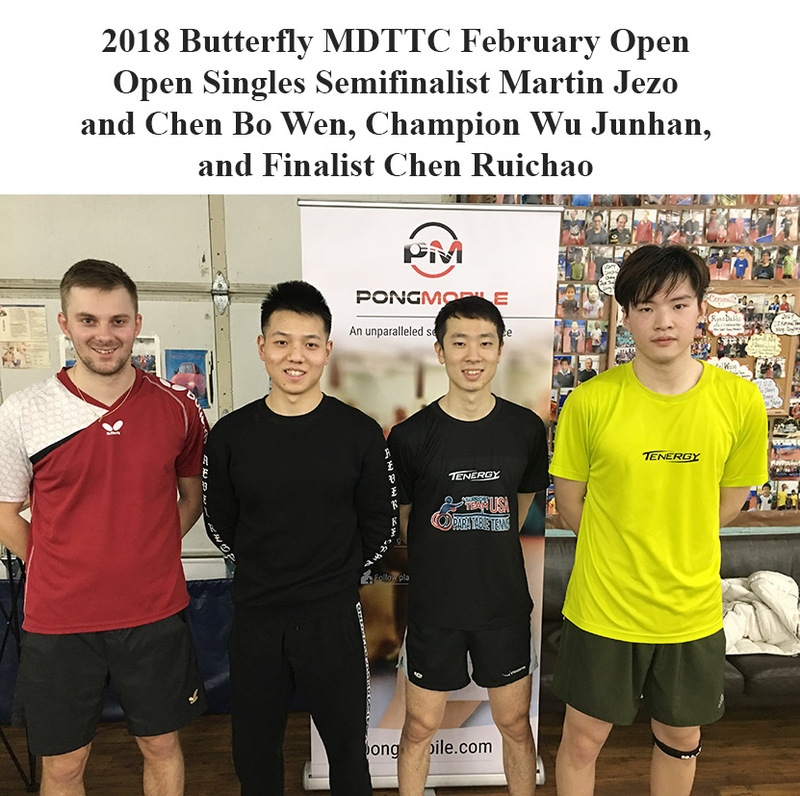 As usual, a great thanks goes to sponsors Butterfly and HW Global Foundation, the latter which runs the Talent Development program that trains at MDTTC – which swept all four semifinal spots in both junior events. 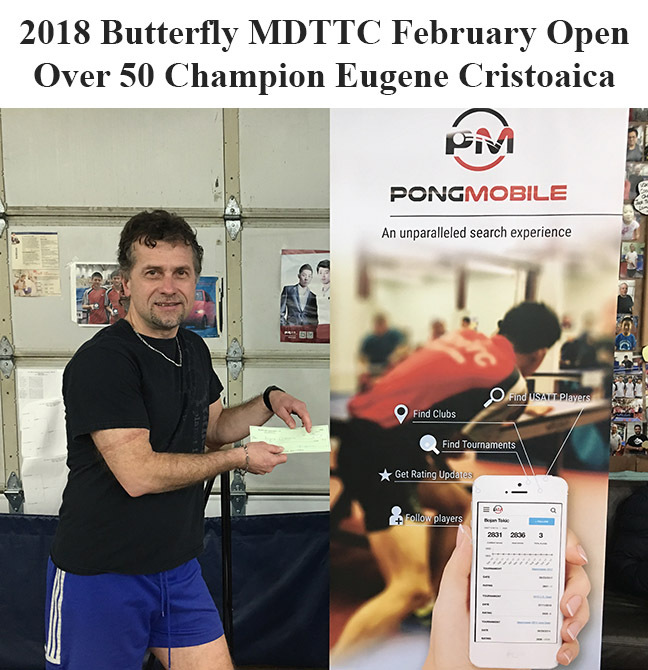 A great thanks also goes to Mossa Barandao of PongMobile, who helped run the tournament – he’s at the control desk the entire tournament doing much of the data input, plus taking pictures - see links below in results. (Mossa also sets up a station at our tournaments and leagues so players can easily look up via PongMobile, their ratings and ratings histories, both in numbers and graphic form. The station is always surrounded by players looking up all their friends, coaches, and rivals.) Thanks goes to referee Paul Kovac and umpire Stephen Yeh. And a great thanks to the 88 players entered in the tournament! Open Singles - Final: Wu Junhan d. Chen Ruichao, 3,6,-12,9,-12,6; SF: Wu d. Chen Bo Wen, 5,6,9,5; Chen Ruichao d. Martin Jezo, 5,7,9,4; QF: Wu d. Roy Ke, 9,6,5; Chen Bo Wen d. Lidney Castro, -5,5,8,7; Jezo d. Shao Boyang, 9,5,3; Chen Ruichao d. Wang Yimiao, -8,9,5,8. Under 2400 - Final: Khaleel Asgarali d. Gabriel Skolnick, 8,3,5; SF: Asgarali d. Shao Boyang, 4,10,3; Skolnick d. Tiffany Ke, 10,9,6; QF: Asgarali d. Xu Rui, 6,7,6; Shao d. Stephen Chu, -2,6,2,10; Ke d. Vikash Sahu, 9,-9,3,4; Skolnick d. Mohamed Kamara, 6,2,7. 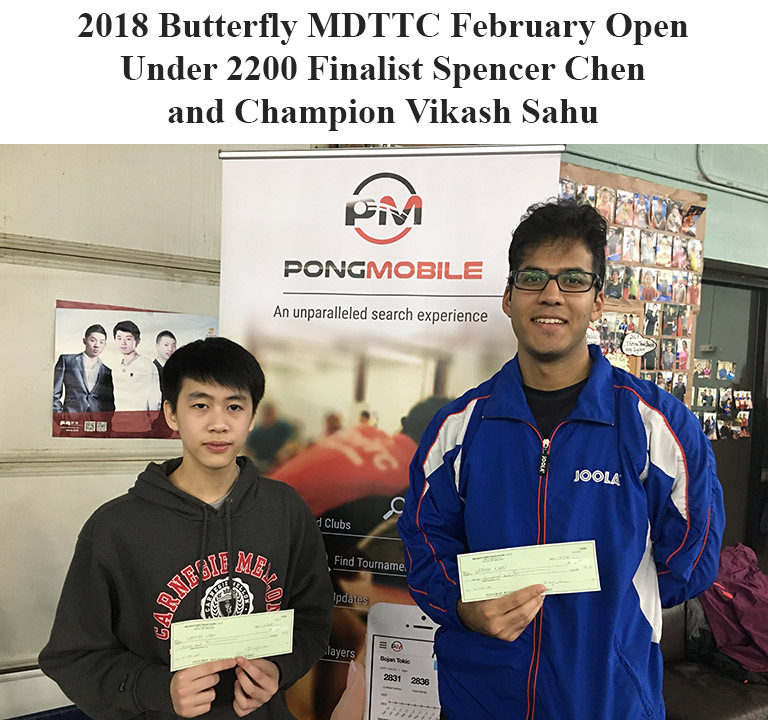 Under 2200 - Final: Vikash Sahu d. Spencer Chen, 3,5,6; SF: Sahu d. Stanley Hsu, 5,10,4; Chen d. Joshua Gong, 9,12,8; QF: Sahu d. William Xu, 7,6,5; Hsu d. Aldin Soneja, 6,-8,8,-8,10; Gond d. Costel Constantin, 6,6,-9,14; Chen d. Lakhan Abichandani, 7,-2,11,6. 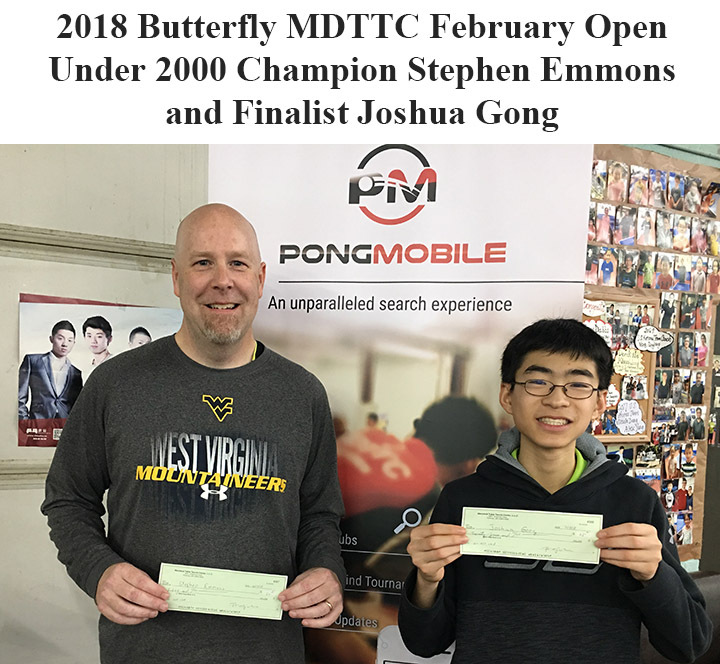 Under 2000 - Final: Stephen Emmons d. Joshua Gong, 8,-9,10,7; SF: Emmons d. Pavan Kumar, 6,12,6; Gong d. Gideon Teitel, 5,10,-2,-6,12. Under 1900 - Final: Stephanie Zhang d. Hanfei Hu, 11,5,-7,-6,7; SF: Zhang d. Robert Gabay, 2,-8,7,-9,7; Hu d. James Zhang, 9,9,6. 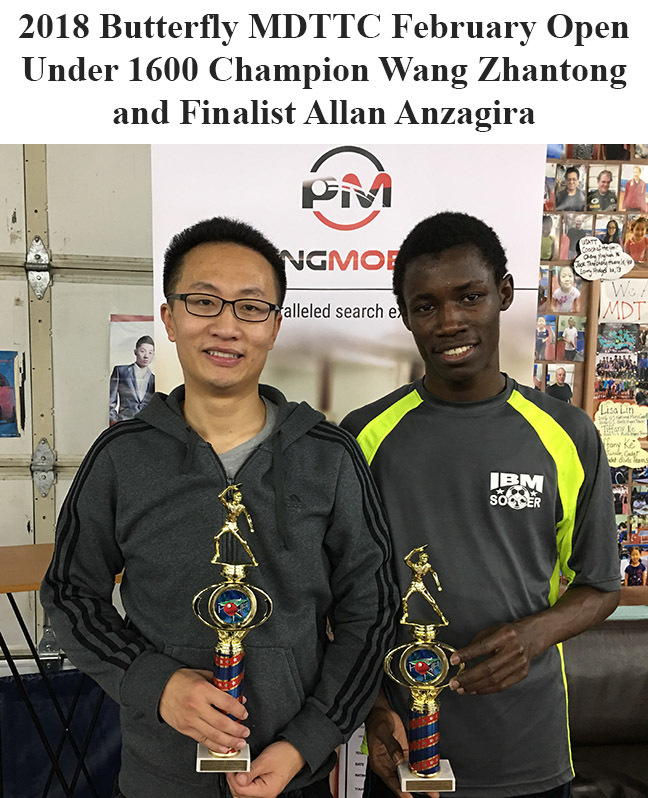 Under 1600 - Final: Wang Zhantong d. Allan Anzagira, 9,-4,-5,7,2; SF: Wang d. Kurtus Hsu, -8,4,4,8; Anzagira d. Anoop Srivastava, 9,4,4. 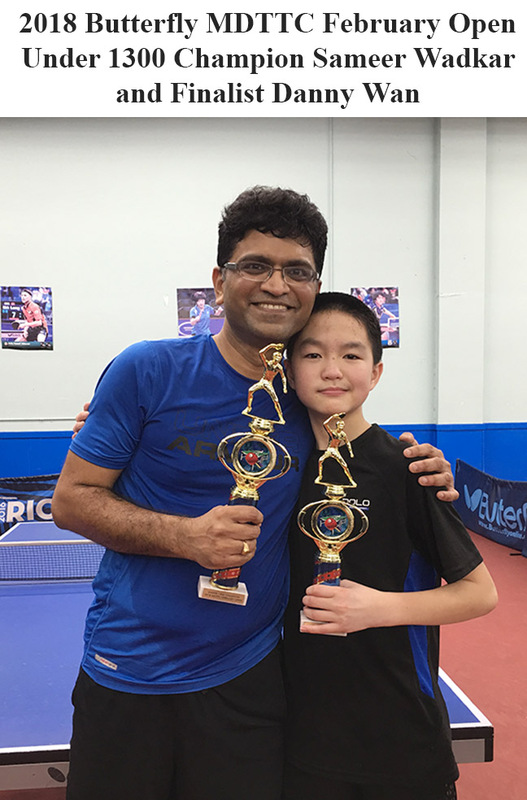 Under 1300 - Final: Sameer Wadkar d. Danny Wan, 8,-8,-8,8,10; SF: Wadkar d. Robert Lehrman, 9,8,5; Wan d. Eugene O'Bryan, -9,7,3,6. 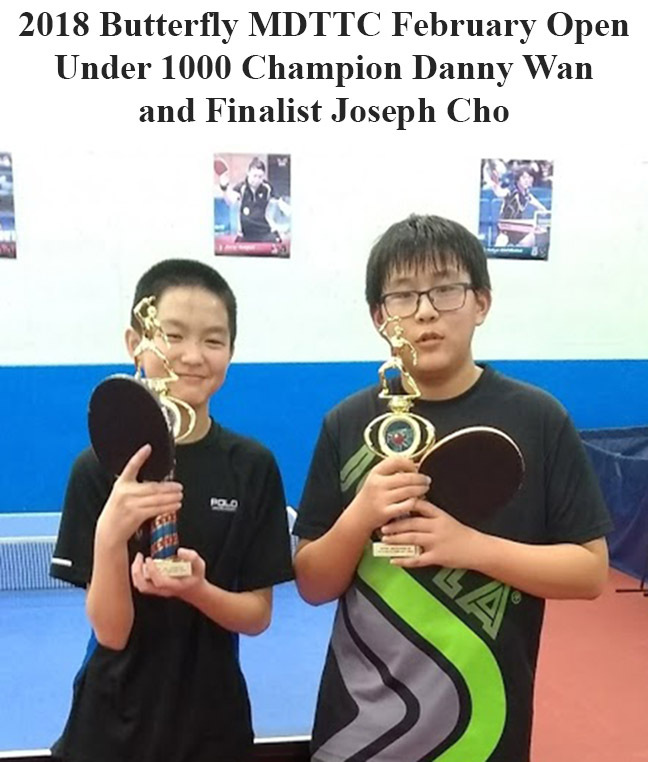 Under 1000 - Final: Danny Wan d. Joseph Cho, -9,7,10,-9,6; SF: Wan d. Matthew Guo, 10,6,7; Cho d. Christian Funderbert, 6,5,12. Over 50 - Final RR: 1st Eugene Cristoaica, 2-0; 2nd Xinsheng Michael Huang, 1-1; 3rd James Wilson, 0-2. 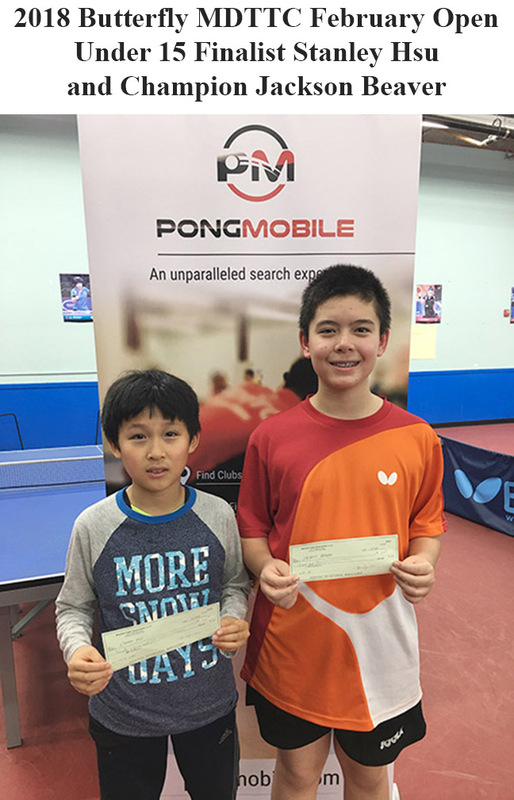 Under 15 - Final RR: 1st Jackson Beaver, 4-0; 2nd Stanley Hsu, 3-1; 3rd Hanfei Hu, 1-3; 4th Todd Klinger, 1-3; 5th Kay O'Hara, 1-3. 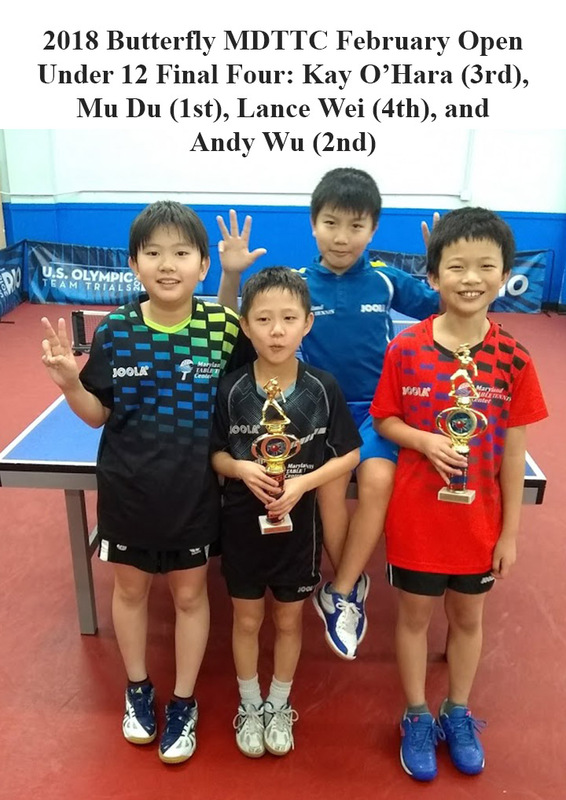 Under 12 - Final RR: 1st Mu Du, 5-0; 2nd Andy Wu, 4-1; 3rd Kay O'Hara, 2-3; 4th Lance Wei, 2-3; 5th Kurtus Hsu, 2-3; 5th Matthew Guo, 0-5. This is what you get when you Google "Table Tennis Valentines Pictures." Here's the USATT article by Richard Finn. I'm one of the coaches for this program. Here are the USATT Guidelines. I created these, based on suggestions and feedback from the Coach of the Year Selection Committee (I'm a member) and the USATT Coaching Committee (which I chair). They were then voted on and adopted by the USATT Coaching Committee. Here's the new USATT manual by Matt Hetherington - ATTENTION TOURNAMENT DIRECTORS!!! Here's the podcast () from PingSkills. 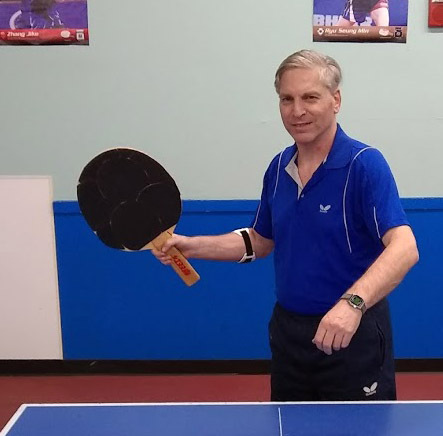 Items covered: Joke of the Week; On This Week; Tournament Wrap; Tip and Drill of the Week; 52 Week Training Plan; Serve to the Body; Practicing Pendulum Serve; and Practicing on Small table. Here's the video - do you practice this? The Koreas: Divided by War, United by a Flag? Here's the article and video (3:31) from CNN. The table tennis is from 0:53 to 2:02. Here's the article and pictures from CBC News in Canada. Here’s chapter 15 of Tim Boggan’s latest volume, which covers 1993-1994. Or you can buy it and previous volumes at www.timboggantabletennis.com. Here's the article, video, and pictures. How Many Times Did the Ball Bounce? Best Guess Wins! Here's the video (1 sec - you read that right) from Karen Chang Wu. Here's the video (1:38). This is over-the-top crazy and absolutely insane! You don't want to miss it. I run the tournaments on Omnipong. It's great for running tournaments, very user friendly, and the creator, Craig Krum, is very helpful when problems arise. We ran into a potentially serious problem with this tournament. I'd made some changes to the time schedule in December, but I didn't think to upload the new entry form to Omnipong until about ten days ago. Yesterday I discovered some players had the old version, and so would likely have shown up at the wrong time - either way early, or (worse) way late, and so get defaulted. But Omnipong has a feature that allows me to email the players, so yesterday I emailed everyone about the entry form, making sure everyone had the correct one. Problem averted. Mossa Barandao of PongMobile will be helping out, as usual. We take turns on who runs the computer, who does the rest (calling players over, assigning tables, sending them out, all the other miscellaneous stuff). International Umpire and Certified Referee Paul Kovac is the referee. I did some investigative work last year, and counted up all the USATT tournaments I've run over the years. This will be my 198th. In April I'll run the MDTTC April Open, and then the USATT Hopes Trials Tournament on April 29 will be number 200. (Followed soon after by the Maryland State Championships in June, #201.) Nearly all of the tournaments have been two-day tournaments - I think only three have been one-day tournaments, including the Hopes tournament that will be #200. The largest was the 1998 4-star Eastern Open, with 411 entries, still the record for a 4-star tournament, excluding the North American Teams, which is listed as 4-star. I have no coaching today, but I'll be going over to the club tonight to get any final entries left there, and to set up. I keep two fold-up tables in the back storage room, which I combine with one of MDTTC's regular lounge tables for our control desk. I set up my laptop, the printer, clear out the tournament results on the wall from the last tournament to make room for this one, and about a zillion other things. Here is my tournament checklist of things to do before the tournament, and things to bring. 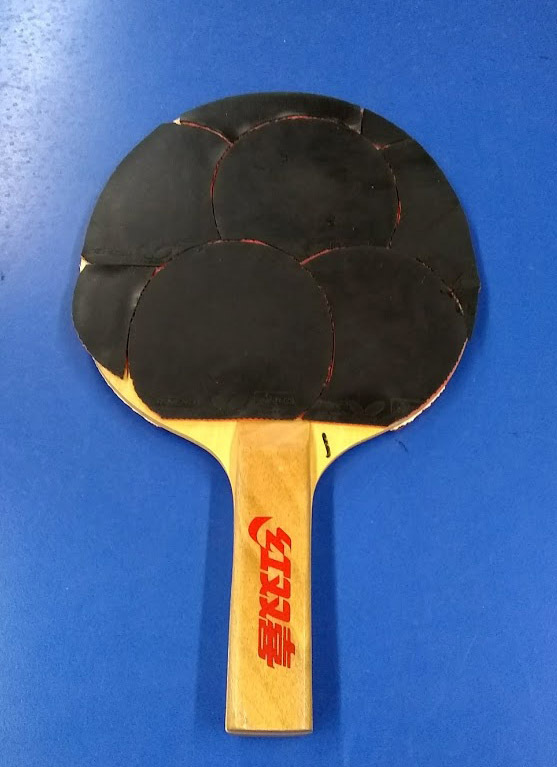 I don't usually put up equipment reviews here, but I'm making an exception - here's a video review (14:16) from Table Tennis Daily of my own blade, the Butterfly Timo Boll ALC! The video features lots of action play by Timo Boll, who uses and help create his namesake racket. I've been using the blade (flared - FL) for about eight years now, with Tenergy 05 (FH) and Tenergy 25 (BH, though I've been experimenting with using 05 there as well), both 2.1mm. I originally discovered it when I was coaching Tong Tong Gong at tournaments, and he used it. When he made the USA Cadet National Team by upset - he was seeded 9th - he and his dad gave it to me as a reward. (I'm now sponsored by Butterfly so I get them free now.) I still use the one they gave me, with Tong Tong's name carved into it! Here's the article from Coach Me Table Tennis (Eli Baraty). "I was asked by an international player my opinion and thoughts regarding handle shape. And how does the grip effect your backhand and forehand strokes?!" Here's the video (8:40) by Tom Lodziak. Here's the article. "Growing up as one of the best table tennis players in the world isn’t like a normal childhood, but it brings its own reward." Here's the article from ESPN. "They were rivals when they first met, she said. Bitter adversaries. Two champions from nations who were -- and still are -- at war. Yet somehow they left each other having forged something deeper." Here's the latest issue that came out on Wednesday. Here's the video (37 sec) from 3T Table Tennis. Here's the video (36 sec) of João Monteiro of Portugal, world #56 (but as high as #12 in 2014). Here's the video (5:26) from two years ago - I ran it then, but I just saw it again and thought I'd run it again. Here's the video (37 sec). Here's the video (59 sec). Lots of funny trick shots! I presume nothing has happened regarding fixing the problem of hidden serves? Coaches still have to go through that uncomfortable routine with their top juniors and parents where we explain that if they want to compete on an equal basis, they'll have to cheat as the top players do by illegally hiding their serves. Nearly every top player obviously hides their serves, and umpires, who cannot really tell if the serves are visible are not, simply do not follow the rules that specify that if they aren't sure whether the serve is legal, they must warn and then fault the player. I made my own proposal, the Net Visibility Rule (basically, the ball must be "visible" to the entire net), and others have suggested the ball must be visible to both umpires throughout the serve, or where the umpire would sit. Or the ITTF could simply takes charge, and set a date where all referees and umpires shall enforce the rules as they are written, with notice to the players, and perhaps (for a six month grace period) allow two service warnings per match. Or we could change the rules to make them easier to enforce, and coordinate this with a decree by ITTF for worldwide enforcement – and then follow through on it. 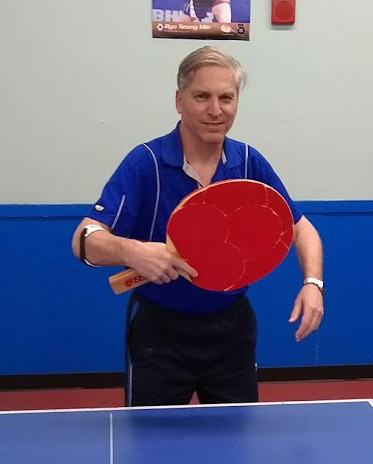 Note that I'm speaking here for myself, but I do plan on bringing this up at a USATT Board Meeting, where we perhaps send a note to ITTF imploring them to take action. I would like USATT to enforce the rule here, but the objection is that if we don't allow our players to cheat like the top players do, we'll be at a disadvantage, both by not using these illegal serves and because our players won't be used to facing them. We're the only Olympic sport that openly allows cheating in our sport; isn't it time we fix this? Or do we want to wait until there are headline articles in the New York Times and other major newspapers around the world about rampant cheating in an Olympic Sport and at the Olympics itself? And yes, hiding the serve is cheating, by definition, though an argument can be made that if the opponent does it first, then responding with your own illegal serves isn't cheating. But it all starts with either enforcing the actual rules (my preference), changing the rules to make them easier to enforce, or both. 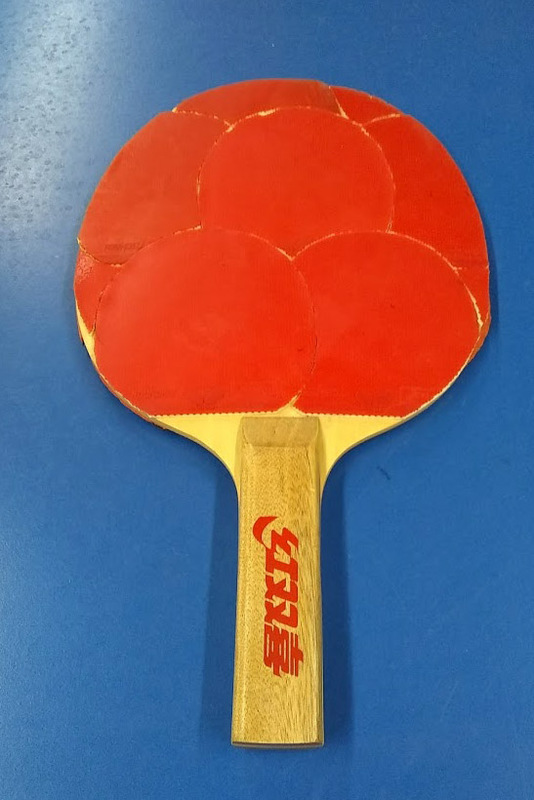 Table Tennis Speed Trap or, Is Your Racket Too Fast? Here's her message, with photos (on Facebook) from Adriana Diaz of Puerto Rico, world #42 and the 2016 U.S. Open Women's Singles Champion. "Hurricane Maria did a lot of damage to our people. Our Club was no exception. Today, thank god and the contributions of Toyota PR, Popular and Universal Group Inc. we celebrate receiving the team that will replace the team damaging during the hurricane. Everyone joined today at our school to install the team. Many children, young people and adults receive the teaching and training offered at our club daily. Sport is a gain for the family, for the people, for society. Thanks for helping us up. A hug from Ōsaka." So You Think You Have A Good Serve? Let's Do a Little Footwork! Here's the video (34 sec). Here's the video (4:39) from a few years ago as I take on then USA Cadet Champion Crystal Wang, who was around 2450 at the time. (I'm about 2100 with the clipboard.) She played rather tentative as she knows I'm actually better if you attack over and over - I've played or trained with her many times as she was developing, both with sponge (a thousand times) and clipboard (dozens of times). Here's where you can buy them! Much of the duties of the various groups is covered in the USATT Bylaws. Article VII and VIII are all about the Board of Directors. Article IX is all about Committees. Article XIV is all about the Chief Executive Officer (CEO), and by extension, the USATT Staff (which reports to him). So how do you go about making changes, or just getting info on a topic? If you have questions, for example, about the U.S. Open or Nationals, or Ratings, or the Web Page, you'd go to the USATT Staff. If you have questions on Rules, or Coaching, or Tournaments (outside U.S. Open and Nationals), you'd go to the appropriate committee. It's not all black and white; while the Coaching Committee (which I chair) sets policy for Coaching Certification, the process itself is run by USATT Headquarters (specifically by Director of Operations, Andy Horn). These committees are the "experts" on their topic. If you want a rule change, you don't go to the USATT Board of Directors; they are not the experts on rules. You'd go to the Rules Committee, and if they agree, they'd give their recommendation to the Board of Directors. And so on. Sometimes there are parallel "experts." If you want to recommend a change in how USATT selects players for the National Team, you could go to either the High Performance Committee (HPC), or the High Performance Director (HPD, a USATT staff person), or both. While technically the HPC sets policy in this area, it is often based on recommendations by the HPD, the hired full-time expert on the topic. However, both are instrumental in setting these policies. If I, for example, wanted to make a recommendation, I'd likely discuss it with the HPD, and then go to the HPC. Many still go to USATT Board members as their first step. That's fine, as long as they understand that they will likely be directed to the appropriate committee or staff person, though of course the board member may also discuss the situation with you. But in general, going to board is last resort. You can also go straight to the CEO, who will either deal with the problem, or send it to the appropriate person. Here's the new podcast (25:35) from PingSkills. Also covered: Joke of the week; On This Week; Deng Yaping's Birthday; Tournament Wrap; World Junior Circuits Final; European Top 16; Drill of the Week; Mental Preparation for Tournaments; Smashing Effectively; and Time to Throw Out Old Bat. Here's the article from Inside the Games. "Dimitrij Ovtcharov’s quest for a fourth consecutive title at the International Table Tennis Federation (ITTF)-Europe Top 16 Cup at the Salle Omnisports du Pierrier in Montreux in Switzerland was frustrated by his 36-year-old German team-mate Timo Boll." Here's the article from ECNS.com in China (in English). "Champion's career in question as TV time replaces table time … It's been too long since Chinese table tennis megastar Zhang Jike stood on the highest medal podium." Here's the ITTF article. "Nils-Erik Sandberg, who started Ångby Table Tennis Club in the western suburbs of Stockholm in 1956, was courtside guiding two young players born 50 years after the venerable Swede founded the celebrated club; Isak Edwardsson and Elias Sjörgen, both born in 2006, were proudly wearing the yellow shirt." Here's the ITTF article. "The International Table Tennis Federation (ITTF) is offering media internship for young media professionals to work as part of the ITTF media team at the upcoming Liebherr 2018 World Team Table Tennis Championships to be held in Halmstad, Sweden from 29 April to 6 May 2018." Here's the video (15 sec) from EmRatThich. Here's the video (19 sec), against Kang Wi Hun of North Korea. Here's the video (1:25) with Zhang Jike. Here's the video (1:26) as Samson Dubina leads a group in munchkin pong. Mark Thompson (USATT Chief Operating Officer) agreed to send the four vintage film reels I found to Scott Gordon, who is USATT's expert on vintage films, in addition to chairing the Classic Table Tennis Committee. (Here's info on both.) Below is what Scott wrote to us yesterday about them, describing the contents of the four film reels.. Scott has also agreed to fly to USATT headquarters later this year to explore the storage area, in particular the many boxes of old VHS tapes. #1 - probably the least interesting is one labeled "Bill Haid", which is just a series of slow-motion demonstrations of basic strokes by some young players. I don't recognize any of them, and at some point Larry should have a look - he might recognize them. It's silent. Presumably it was meant as a teaching aid. It's labeled "1982" and that looks about right. #2 - This is a Dunlop-produced film of Barna and Szabados from the late 1940s. I already have a copy of this one, but this reel is in better condition than mine, plus it has the missing 30 seconds from my copy. So it's good to have (and digitize), but nothing really new. #3 - This is a staged exhibition between Bellack and Glancz, looks like from the early 1940s, with commentary. I've never seen this one before, and it is very well done. A great find. #4 - This is the most significant find. It is a film called "Table Manners" that was heavily documented in older USTTA materials from the 1940s, but a copy had never turned up. Accompanying it was a sheet of paper from a film transfer house stating that it was unrecoverable. Sure enough, the first 30 seconds or so are badly chewed up. Someone obviously tried to run it through a bad projector. But thereafter, it is in great shape. It features Bellack, Glancz, Pagliaro, Aarons, Halliday, and Fuller. There is lengthy footage of Glancz and Aarons doing their exhibition routine, and it is even better than the footage many of us have seen from Movietone/Pathe/etc. This is a really fantastic reel, and an important historical artifact. Aarons is incredible on this film. I'll work on digitizing them during spring break. If you want to read about these past USA stars, you can visit the USATT Hall of Fame Profiles. If you want even more, buy some of USATT Historian Tim Boggan's History of U.S. Table Tennis books! Eventually, what I'd like to see is a genuine USATT Museum. We sort of have one at the Triangle TTC in North Carolina that has a number of exhibits (mostly donated by Mike Babuin), but I'd like to see a building dedicated to this, with a full-time curator, where we would collect all our vintage USATT stuff in one place for the public. It would mean finding donations to pay for it, perhaps with the donors making up the Board of Directors. I may look into this later. Here's the article by USATT High Performance Director Jörg Bitzigeio. Here are other documents on USATT Team Selection Procedures. Here's the ITTF article. I mentioned yesterday it was an all-German final at the European Top Sixteen; here's the ITTF article on it. "Success for the top two seeds at the semi-final stage of the Men’s Singles event at the China Construction Bank 2018 ITTF Europe Top 16 Cup on Sunday 4th February; thus for the first time ever in the history of the tournament, which started life in Zadar in 1971, it will be an all-German final." Here's the ITTF article. "Applications are now open for female scientists and coaches to apply for a grant in support of their attendance at the forthcoming Sports Science Conference: The Science and Practice of Racket Sports for Improved Performance and Health to be held in Halmstad, Sweden from Wednesday 25th to Saturday 28th April." Here's the video (10:43). Franziska (GER) is world #38, Jancarik (CZE) #112 (formerly #94), from Arnaud Scheen. Here's the video (34 sec)! That's Hugo Calderano of Brazil hitting, Mikael Simon of France lifting weights, and me wondering why I haven't tried this. Perhaps the most interesting session was with a player who wanted to attack short backspin balls with his backhand. There are really three types of backhand flips, and he's the type that wants to know about everything, not just the techniques he works on. So I went over with him all three types. Many players and coaches lump the first two types of flips together, but comparing a regular backhand flip to a topspin backhand flip is like comparing a regular drive to a loop - one is light topspin, the other great topspin, so they aren't really the same. Regular backhand flip. This is just a regular backhand drive with perhaps a shorter stroke, where you stroke up a bit more to compensate for the backspin, and put a light topspin on the ball. This is the easiest and most common below the higher levels. It's how I learned originally and still mostly flip, though I can do all three. Topspin backhand flip. This is basically a mini-loop, where you really topspin the ball by using forearm and wrist, and grazing the ball more. The extra topspin gives greater difficulty to the opponent and allows a more consistent aggressive flip. The difficulty is the table is in the way, so it's difficult to lift short, heavy backspin. Many top players do both this and banana flips, using the topspin flip against balls that aren't heavy backspin, and especially against side-top serves that they can basically flip away by spinning almost on the top of the ball. Banana backhand flip. This is the modern way, done by nearly all top players, where instead of trying to lift the ball up directly against the backspin, you approach a bit from the side, and put both topspin and sidespin on the ball. This way you aren't fighting the backspin directly, and you can backswing a bit to the side, so the table isn't in the way so much. Here's a video of Ma Long (3:25) demonstrating his backhand banana flip - not how he backswings from the side. Here's the USATT article by Matt Hetherington on Kanak winning the ITTF World Junior Circuit Final in Luxembourg. Here's the ITTF article. Here's video (28 sec) of a great point from the final. Here's the home page for the event, with results, articles, pictures, and video. Here's the ITTF home page for the event, which was held this past weekend. Last year's champions, Dimitrij Ovtcharov and Li Jie, both lost in the finals. Congrats to new champions Timo Boll (first all-German final in history) and Bernadette Szocs! Here's the ITTF article on the finals. Here's the newsletter, with links to a number of coaching tips. Here's the article from PingSkills. "So we have reached the end of January. What would you like to achieve in 2018 with your Table Tennis? … The first thing is to set yourself some goals for the year." Here's the feature article and video (2:43) on Estee Ackerman. Here's the video (21:45) as Sharon Alguetti defeats Nuo Xu of China. Here's the video (52 sec) from Adam Bobrow. "…almost 4,000 competitors and one of the 10 -year-olds beat me when he was 9...and he was runner up (just FYI). 48 tables and every match had an umpire in uniform and it seemed that every player had a coach." Here’s chapter 14 of Tim Boggan’s latest volume, which covers 1993-1994. Or you can buy it and previous volumes at www.timboggantabletennis.com. Michael Levene asked on Facebook: Ever need to adjust a Table Tennis net but don't have a net measure to hand? Of course many people answered you could use a dollar bill, or even a racket (which almost always is 6" from tip to where the handle starts). Here was my answer. "Just balance 8 pennies on top of each other, edge to edge. That's how I always do it, but it takes a few hours to balance them - it's so irritating when you balance seven and then it falls over before you get the eighth, and it sometimes takes me a week to get all the nets at my club measured. I usually end up gluing the pennies together, and then you have exactly six inches. Wait, I could have used a dollar bill???" The last ten minutes were the most disgusting in table tennis history. As I explained to them, I have a pet Saint Bernard (I don't), who slobbers everywhere, so I had gathered all his slobber into a bottle . . . and if they hit the bottle, I had to drink it! Suffice to say, my appeals to common decency ("Friends don't make friends drink dog saliva!") didn't work, and I was forced to take many drinks. Usually I do this with "worm juice," but I'd left my Gatorade behind, and so had to use a regular water bottle. In another session I was working with an older beginner (under 1000 level) who was having trouble pushing in games - kept popping them up. We figured out the problem - he regularly practiced pushing with me and others, but in games many players his level, while they can push with backspin, can't serve with much backspin. And so he was getting no-spin serves and pushing them as if they had backspin, and so the balls popped up. After warming up his push, we did a simple drill where I serve no-spin, he'd push it back by chopping more down on the ball to keep it down (and where he has to create his own spin, since there's no backspin rebounding off his racket as backspin), and then we'd continue pushing, where he had to adjust to the balls that did have backspin. I have a long history of using over-sized rackets. I have an even larger one covered with hard rubber, which I use in exhibitions, mostly chopping and pick-hitting. I'm pictured using that one in an exhibition on the cover of one of my books, Table Tennis Tales and Techniques. I blogged on Wednesday about the crisis USATT was facing in regard to clubs and SafeSport. Sure enough, we had a huge drop in USATT affiliated clubs. As Thursday morning, we had 263; by Thursday afternoon it was down to 138. As of this morning it's at 148 as apparently ten more clubs complied with SafeSport. So we're at 148/263 = 56.3% SafeSport compliance - or, seen more accurately, 100% compliance among USATT affiliated clubs, since the 115 who have not complied are no longer on the list. I'm pretty sure more will comply, but I have no idea how many we'll end up losing. Here's the ITTF home page for the event this weekend, Feb. 3-4, in Montreux, Switzerland, with draws, results, articles, list of players, pictures, and video. 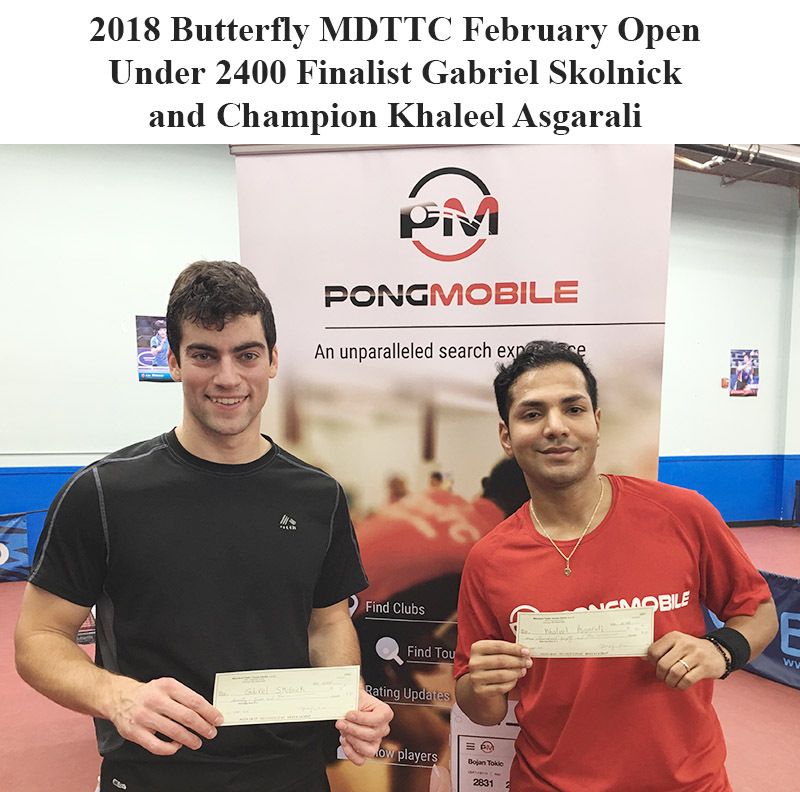 Here's info on the 3-star $2700 Butterfly MDTTC February Open I'll be running Feb. 10-11 in Gaithersburg, MD. It includes links to how to enter online, and to the entry form. There are 11 events. On Saturday: Open, U2400, U2200, U2000, Over 50, and Under 15. On Sunday: U1900, U1600, U1300, U1000, and Under 12. Here's the great Promo Video (1:33) for the tournament, created by Mossa Barandao of PongMobile, who helps run the tournaments. Here's the Facebook version. Want to buy a table tennis book? Here's my Amazon page where you find mine. I sold 146 books in January, not a bad month. Why not order one and see what all the excitement is about? Or you can by Dan Seemiller's Revelations of a Ping-Pong Champion, Samson Dubina's 100 Days of Table Tennis, or one of Tim Boggan's History of U.S. Table Tennis books. Table Tennis, Reading Spin, or Is It the Amount of Spin? Here's the article by Eli Baraty. "Most players can read spin; when someone cuts under the ball, they know it's backspin, when they hit the side of the ball they know it's side-spin. Only on the serve do people struggle to read what spin is on the ball, due to deceptive movements after the point of contact." Here's video (67 sec) of it at regular speed and slow motion, Zhang Jike style. Not sure who the server is. Here are five featured videos from Samson Dubina. Here's the article, with links to three videos. There are now six episodes up of Pong Road. This is the ongoing tales of Rocky Wang, table tennis star and artist, chronicling his table tennis travels. The episodes range from about nine to sixteen minutes. You can read more about it in The Story page, and about Rocky and director Mark Weismantel at the About page. Here are links to three ping-pong anime shows. "Ping Pong is the focus of these anime. Training and competing in tournaments or championships are common themes in sports titles, as well as individual or team spirit, or being an underdog who goes against the odds to succeed."